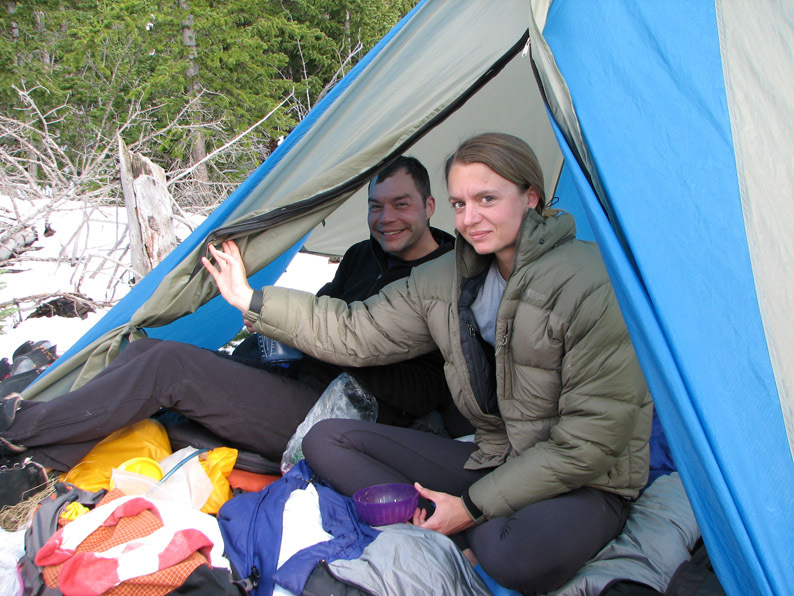 This is the Part I of a four-part trip report of a multiday backpack and climb of Crestone Peak and Challenger Point on May 24-28, 2007. To jump to the second part, click here or go back to expedition summary. This trip report was posted June 5, 2007. They say getting there is half the fun, so before getting into the core of this trip report, I'm including some pictures of the trip down there, the gear we took, and some updated information about the Spanish Creek trailhead. This five day trip required a ridiculous bevy of gear. 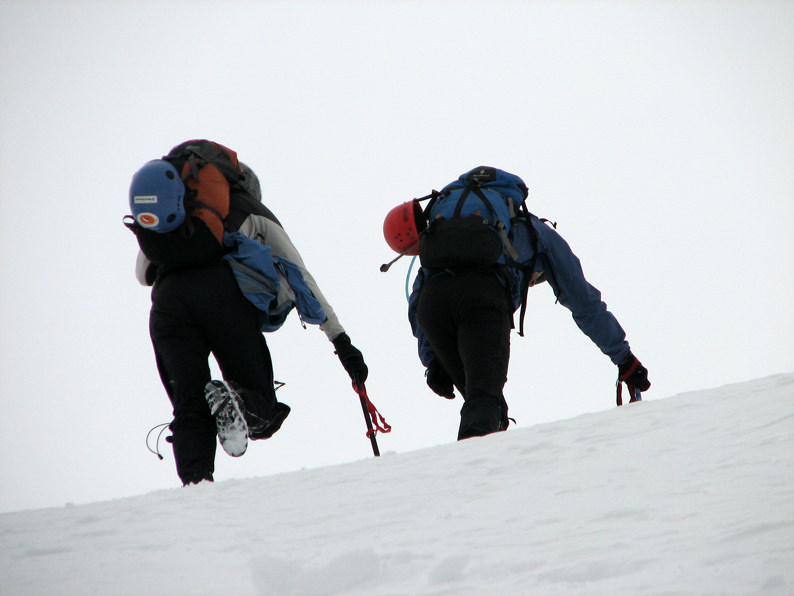 Due to the uncertain Spring snow conditions, I took technical snow climbing equipment (crampons, ice axes, helmet, snowshoes, skis and ski boots, and trekking poles. I also took four different backpacks: a full expedition backpack, a pack for longer day climbs, a Camelbak (in case we did any shorter climbs or runs), and a pack specifically for carrying skis. With all the assorted clothing and multiple pairs of gloves, jackets, etc., my Pontiac Bonneville trunk and three car seats was nearly full with just my gear! The trip started in earnest when I met Eric at his house in Boulder late Thursday morning. The third member of our group, Alison, showed up a few minutes later. 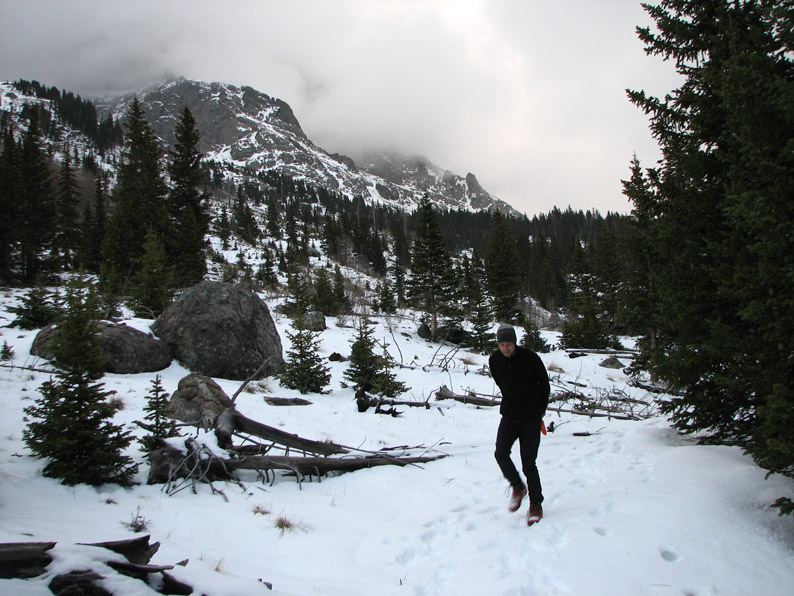 We combined all our gear into Eric's Adventuremobile (Toyota 4Runner) and headed down to the flagship REI in Denver - I still needed to pick up some mountaineering boots that could accept crampons. Using my double plastic boots seemed like overkill, but my old hiking boots were not really up to the task of technical snow climbing. After about an hour and a half, I finally found some boots that would work and we headed down the road again. We headed down US-285 and traversed the high elevations of South Park, then headed down into the Rio Grande river valley. 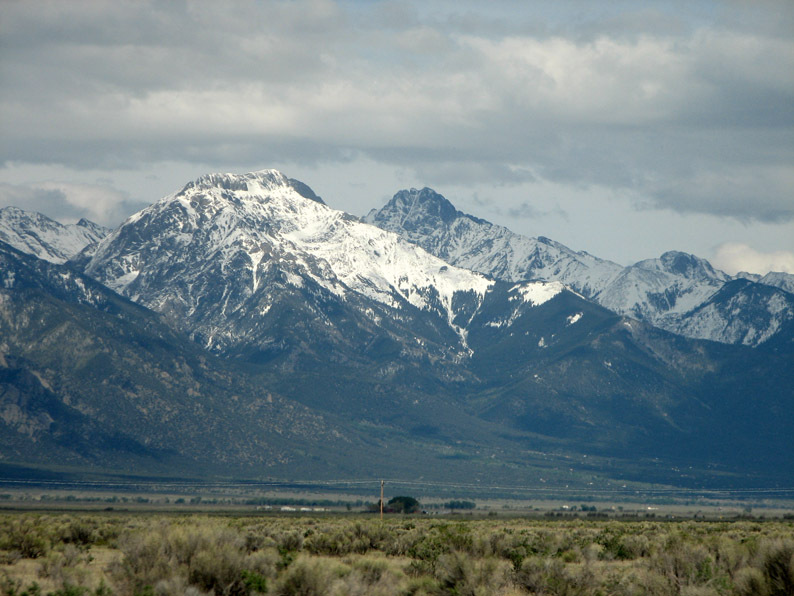 A late season storm had plastered the Sawatch range (the above view shows Mount Princeton) with a fresh coating of snow. 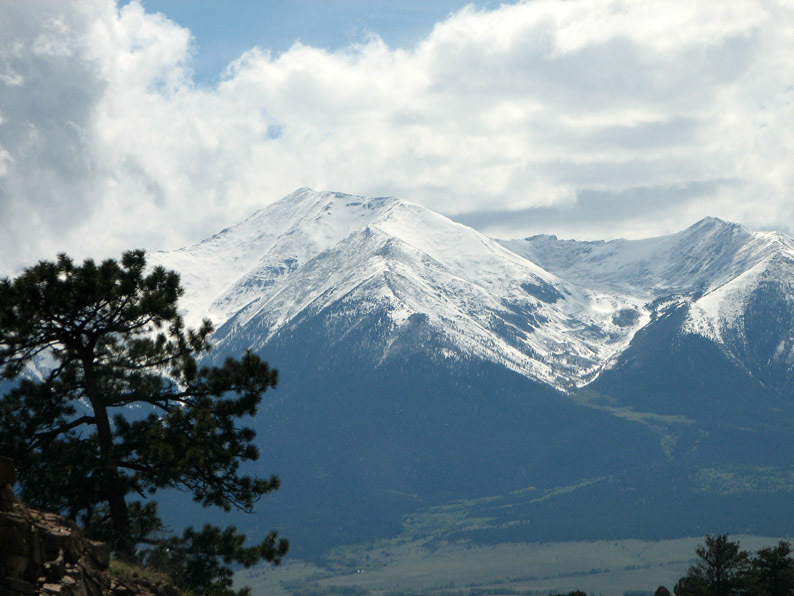 The juxtaposition of lower green slopes with white snowcapped peaks was a sure sign of Spring in Colorado. Bypassing Salida, we continued south on US-285 over 9010 foot Poncha Pass and started our gradual descent into the expansive San Luis Valley. 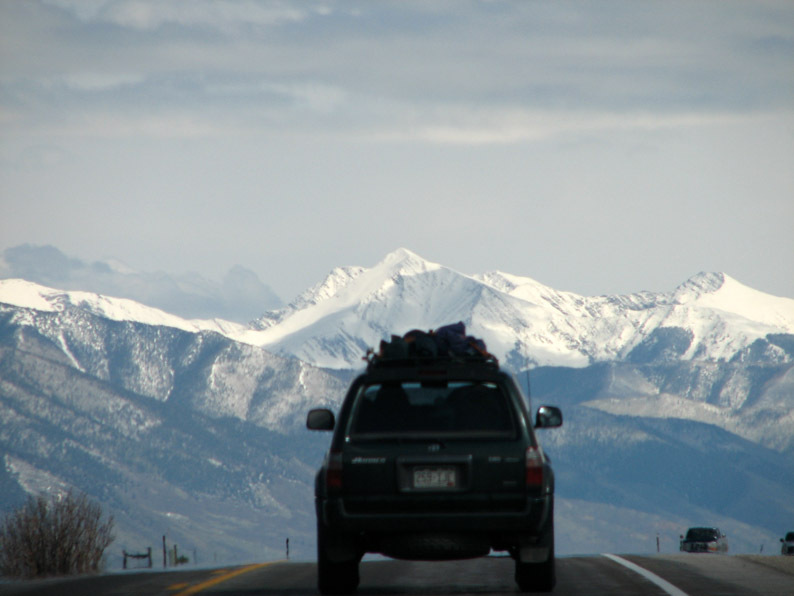 The vehicle in front of us undoubtedly contained individuals who were, like us, seeking adventure in the Colorado mountains. After another 30 miles or so, our quarry came into sight. 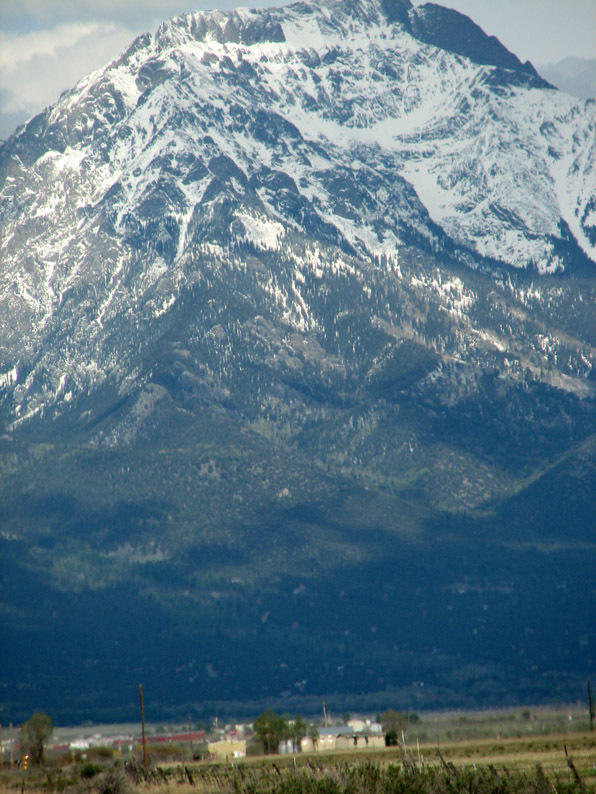 The prominent flat-topped peak on the left is Challenger Point, while the peak in the center is Crestone Peak. The majestic Crestone group rises in a dramatic 6000+ foot sweep above the desert with barely a foothill. These mountains are probably the closest thing that Colorado has to compare with the Grand Tetons of Wyoming. 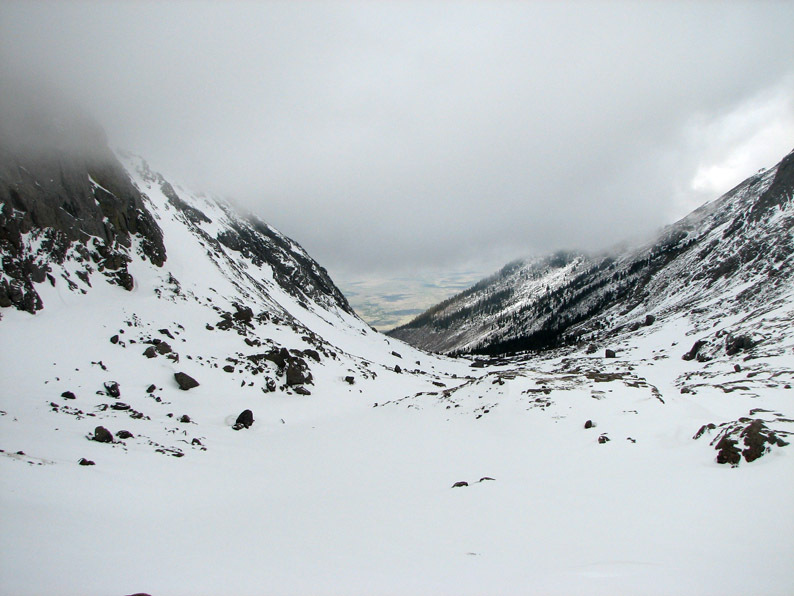 We turned off of CO-17 and headed toward the town of Crestone, Challenger Point loomed higher and higher. 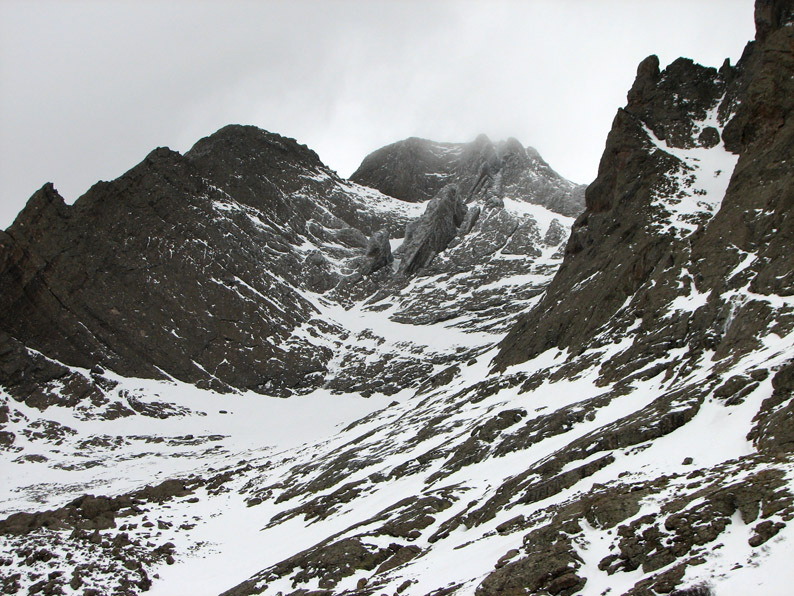 We caught a glimpse of the route we hoped to climb on Crestone Peak - the Northwest Couloir. 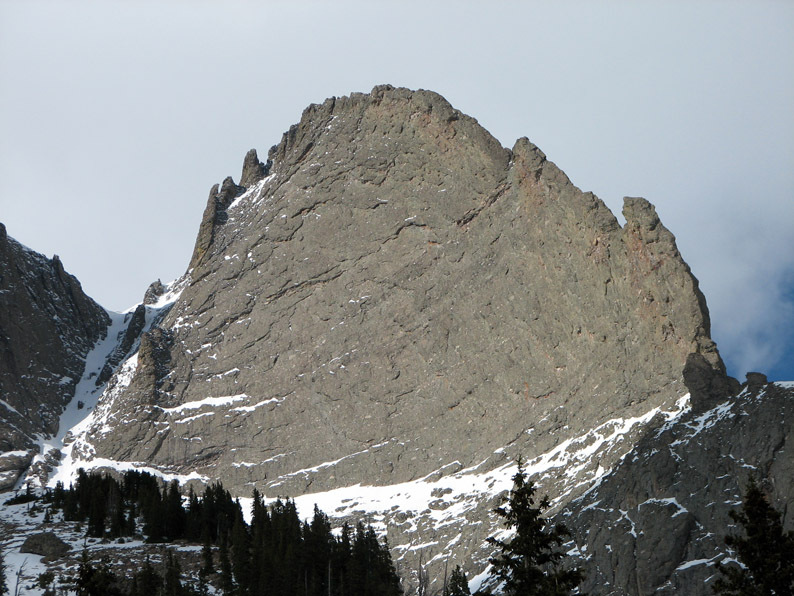 In this photo, the couloir is visible as an almost straight white line which angles up and right very steeply to a notch just to the left of the peak. Wow! We are planning to climb that? Are we out of our minds? We'll see . . .
We had a bit of trouble finding the obscure "trailhead" for Spanish Creek. After going too far, turning around, and coming back, and turning around again, we finally located Spanish Creek at around 5:45 PM (it is just after the Ashram and just before the Zen Meditation Center). There was a pullout plenty wide enough to park in. A local out walking his dogs stopped and informed us that in just a few weeks, it was likely that the Spanish Creek trailhead will be closed to hikers and that the sheriff would be given authority to tow cars. The Spanish Creek approach passes through private property and apparently the property owners don't like hikers passing through their land. The Cottonwood Creek Trailhead, just a couple miles further south has apparently also been closed. 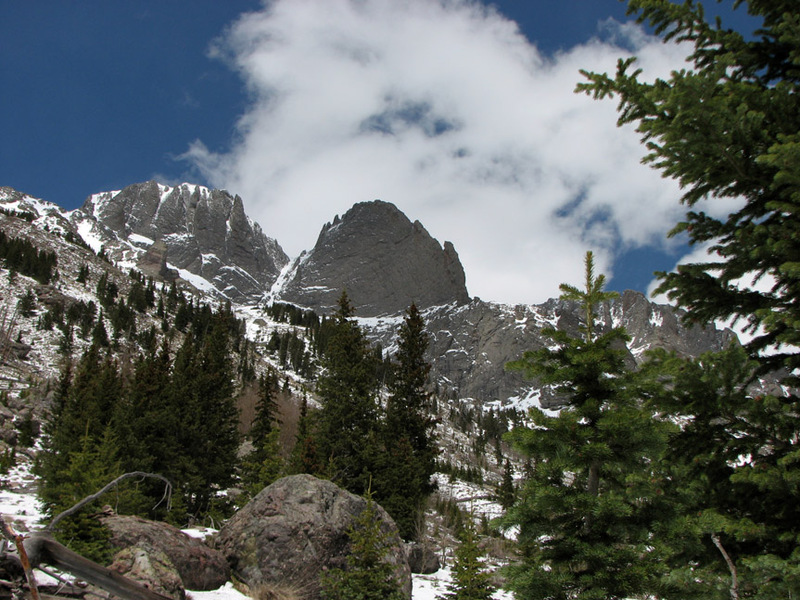 Willow Creek Trailhead is now the only official trailhead access from the west side of the Crestone Group. 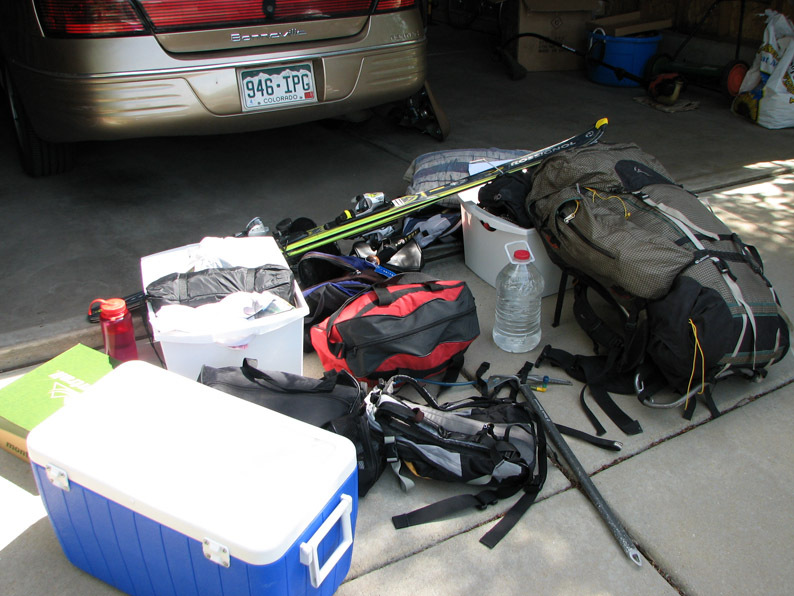 After packing and repacking our packs, we finally settled on the essentials that we would need. The weather forecast for the next day (Friday, May 25) was sounding iffy, so we decided to take two night's worth of food in case we needed to stay up there an extra day. This turned out to be a wise move. 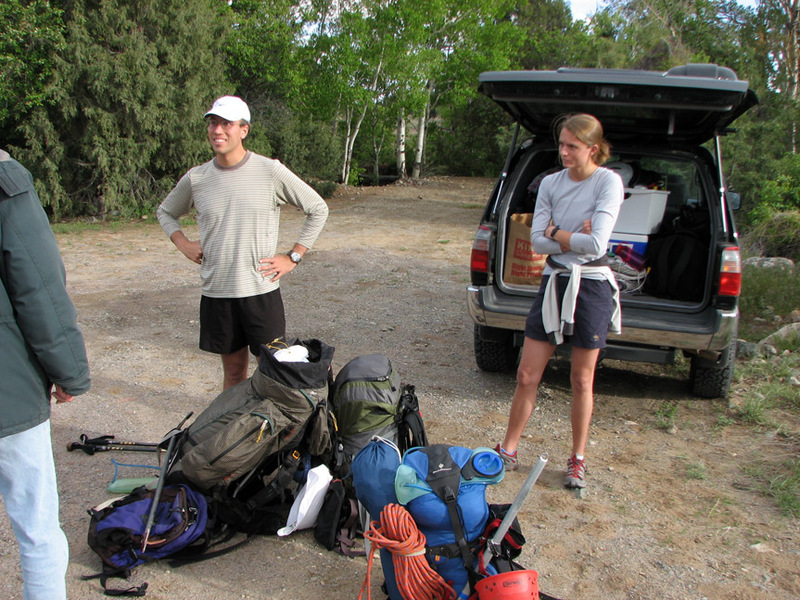 All of our packs were heavy, but mine was probably the heaviest, at about 50+ pounds. 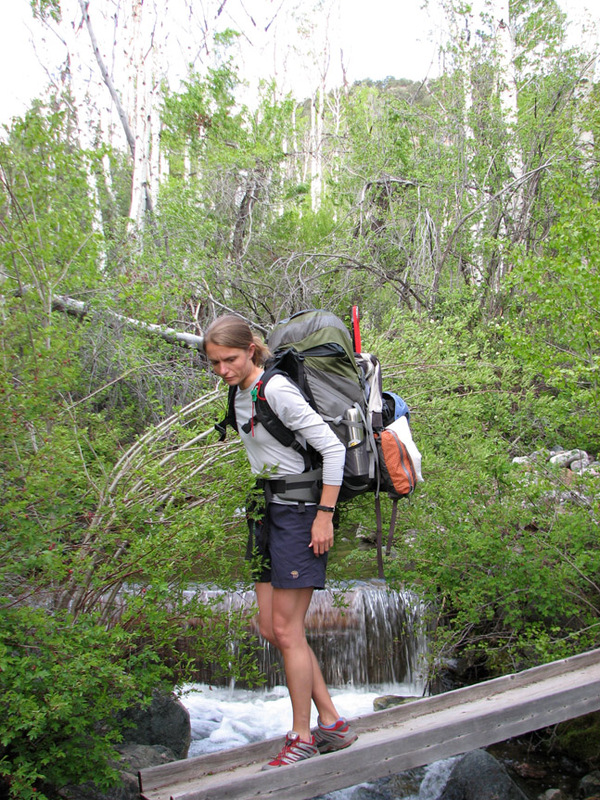 My pack is a 6000 cubic inch expedition pack (L) which weighs 6 pounds itself with all the side and back pockets. Because my pack is so large, I had to carry another backpack to use for the actual climb of the peak! Eric's pack (R) was much smaller, but was very dense - he was carrying the rope and the "tent" (a very lightweight, but spacious tarp shelter). Here is the obligatory "group photo" - it's always a good idea to take one of these to do a "before" and "after" comparison. 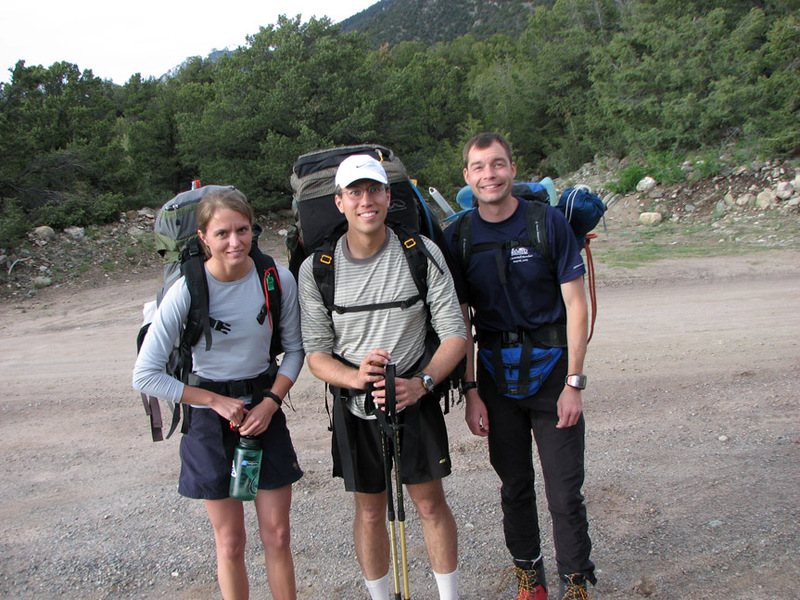 From left to right: Alison Ordelheide, Jonathan Vigh, and Eric Sigler. We left the trailhead at 6:20 PM. 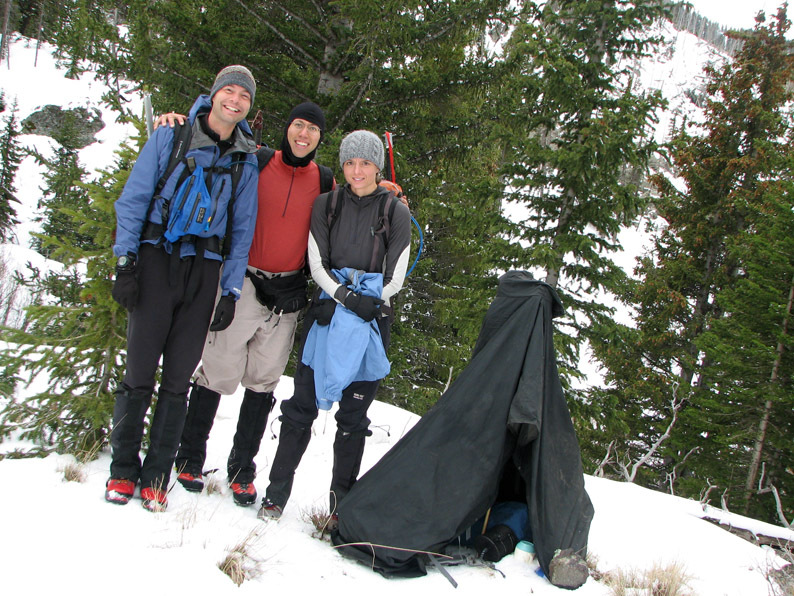 We hoped to get up to 11,000 feet level of the basin where some good camping spots were to be had. But this was 3.5 miles up the trail, and 2800 feet of climb (we started at 8200 feet). And sunset was about 2 hrs away! The "trail" is marked by a sign which reads Huia Temple Path. 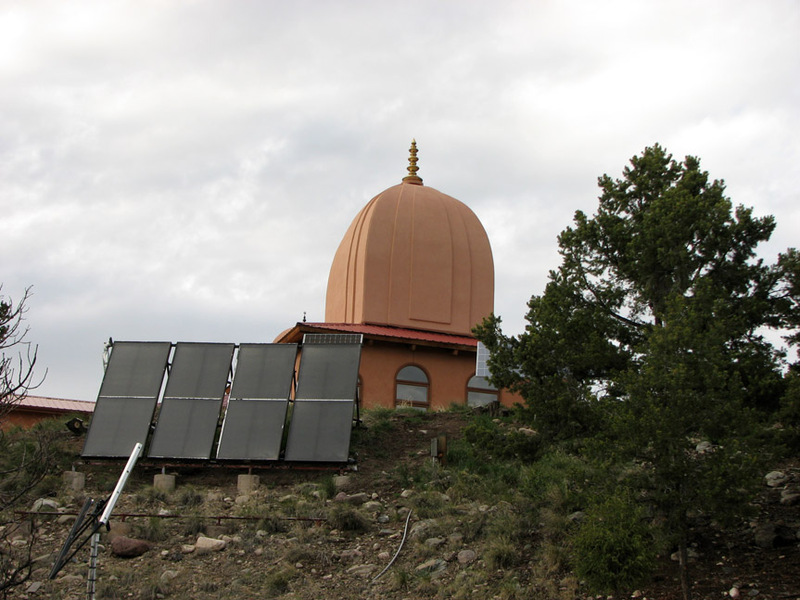 Soon the trail passes below a solar-powered Ashram. 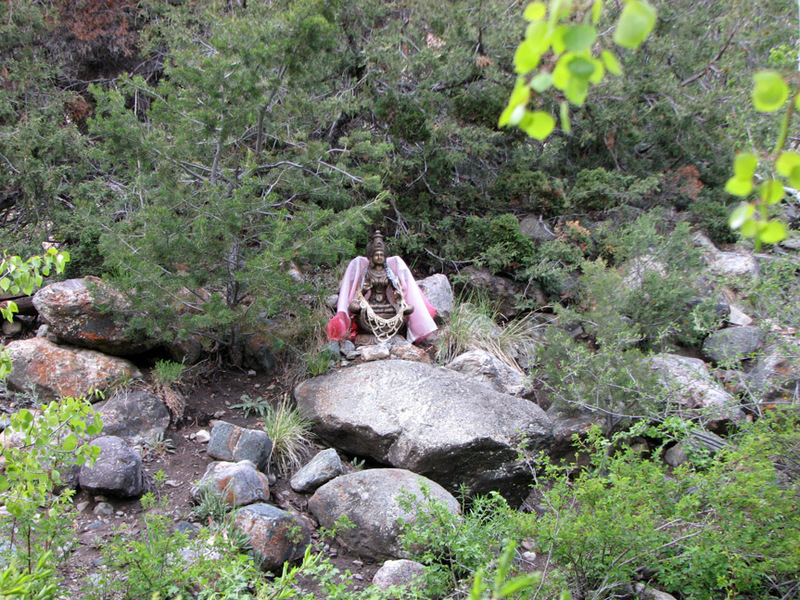 The town of Crestone is quite eclectic, and the area near the trailhead is home to various New Age and Buddhist centers. Here a Buddha greets passersby. We got confused on when and where to cross Spanish Creek (Gerry Roach's book says that the trail crosses to the south side twice). We tried crossing to the south side on this little bridge, but there didn't seem to be a trail on the other side, only a thicket of dense underbrush and thorns. We came back to the north side and bushwhacked through the vegetation, eventually something resembling a trail. But soon the canyon walls closed in and we had to choose whether to go up or cross the creek. We went up a steep slope and started skirting along ledges 35 feet above the creek. This didn't seem right - the Spanish Creek approach had been described as difficult, but we didn't expect it to be this baffling. After skirting across a particularly interesting cleft in the ledge, we decided to bushwhack back down the creek and find another way. We crossed the creek and soon found a good trail on the south side. After probably less than half a mile on the south side, we crossed back to the north side. 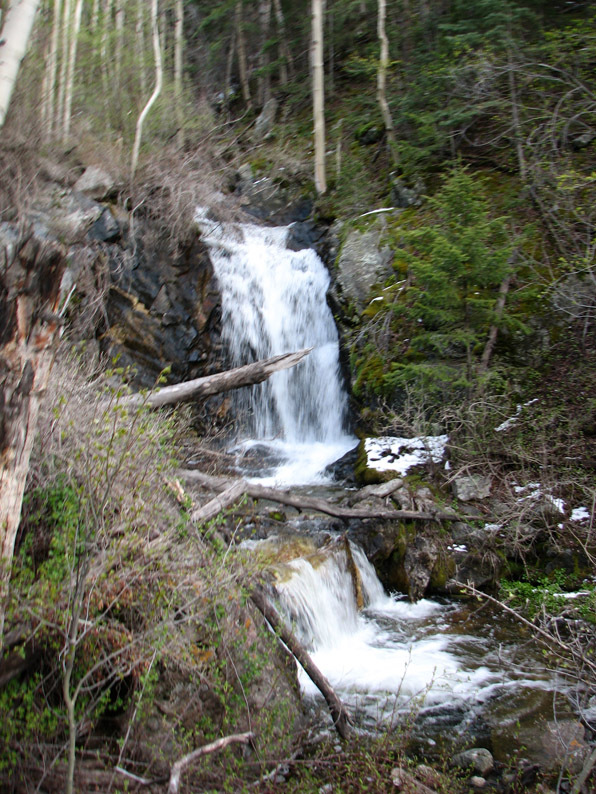 At roughly a mile and a half in, we came across this nice waterfall. 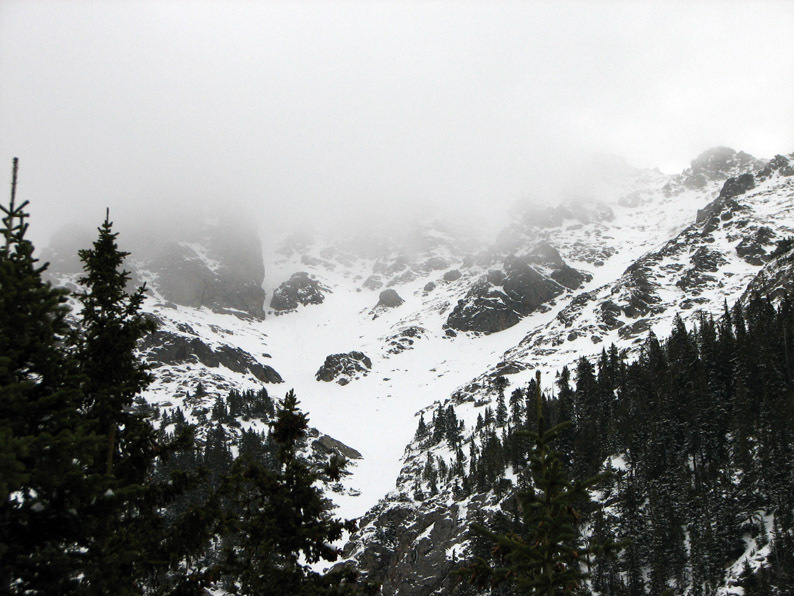 As we climbed past 9000 feet, we started seeing fresh snow. It wasn't very thick - just a few inches at the most, but a sign that winter was still close at hand. After following good trail for another mile, we somehow got off track and ended up near the bottom of a steep hill filled with downed trees. 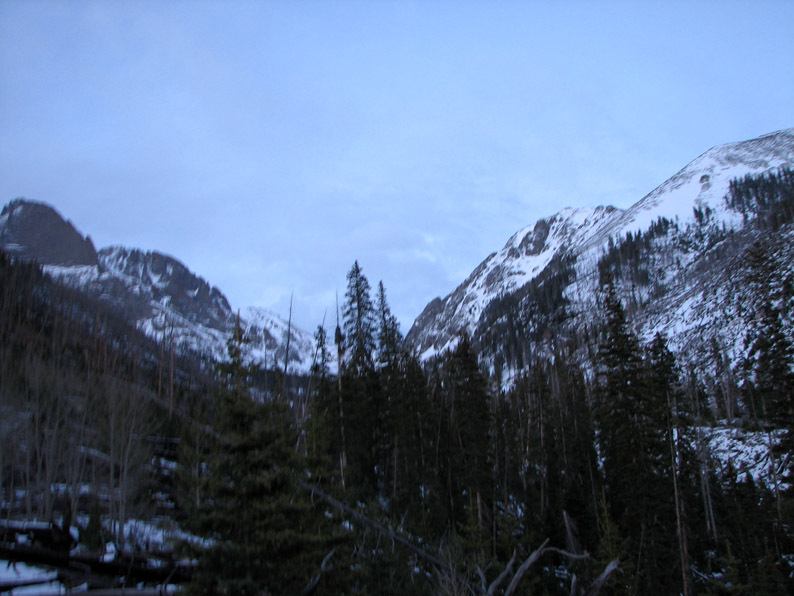 It was starting to get dark, and we still had about 700 feet to climb and maybe a mile to go. And it was getting quite dark . . . This was turning out to be a challenging backpack. 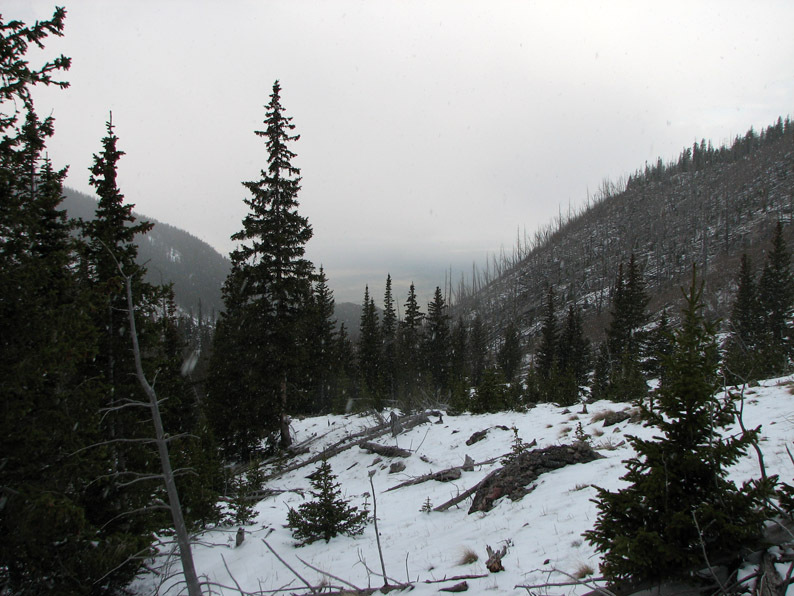 We powered up through the tangle of fallen trees and found the trail, but then the magnitude of our challenge became more apparent - the downed trees were part of an immense burn scar which stretched up the valley. We crossed dozens of downed logs which were made even more slippery by the recent snow. I banged my knees several times - blood started to ooze. Then the moon started rising, bathing the stark landscape. As the remaining glimmers of dusk were departing to the west, we finally reached the trees and quickly settled on a campsite. 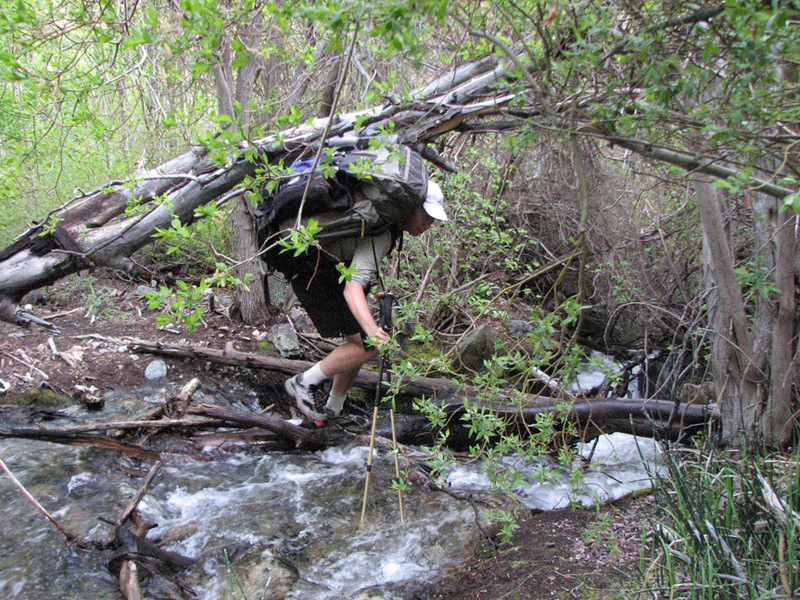 it was the first protected and fairly flat area that we came to, and happened to be close to a small brook. 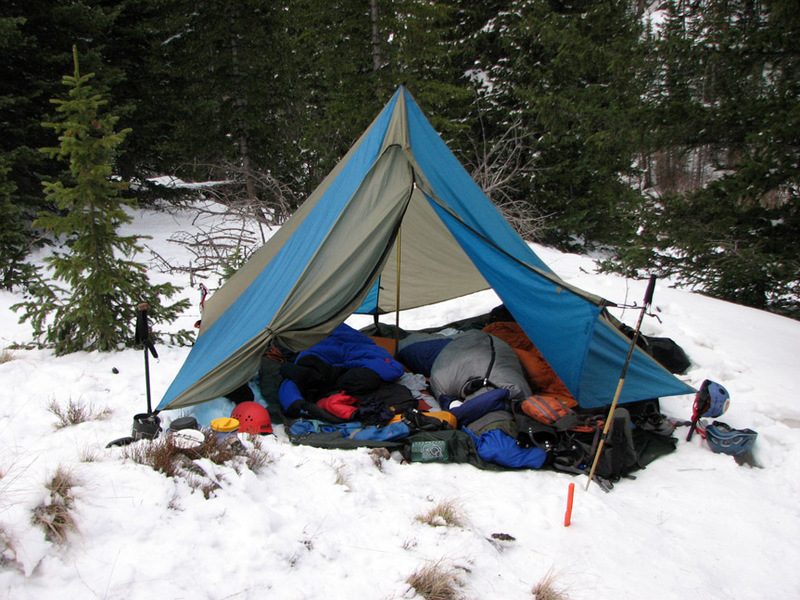 We weren't picky - we pitched the tarp shelter and settled in. After a hot meal, we hit the sack at around 11 PM. I didn't sleep very much the first night. I am a notorious bad sleeper when it comes to camping, and this night wasn't the exception. First, a very strange creature started wailing somewhere outside of camp at around midnight. It was a very odd sound that I couldn't quite place - maybe a sick coyote, a disgruntled moose, or pandering raccoons? 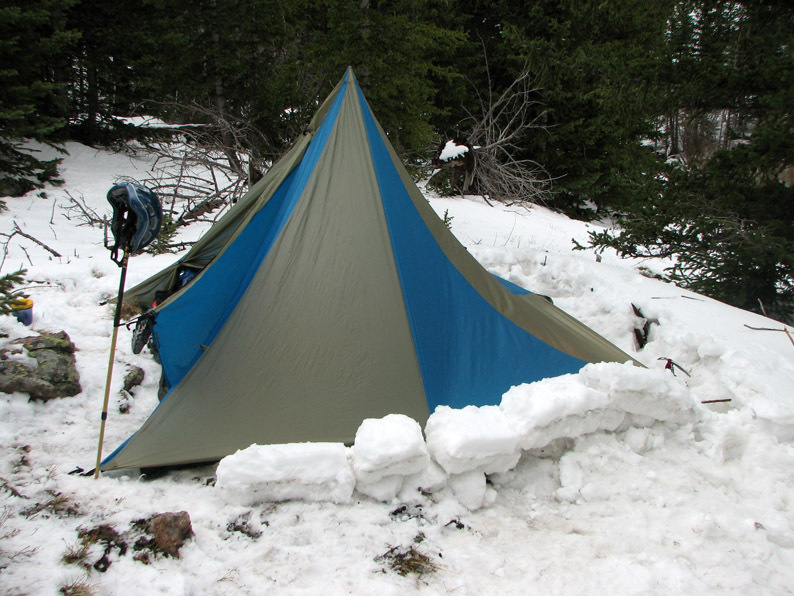 Then a windstorm blew up at around 2 AM - for a while the tarp shelter made quite a racket and some snow pellets fell. We had staked the tarp down with our ice axes, and thankfully these held, but the weather was sounding a bit ominous for tomorrow's climb - the National Weather Service had been talking about a weak disturbance coming through on Friday, bringing a chance of rain/snow and wind gusts of up to 35 mph. We were hoping it would pass by quickly overnight . . .
After what felt like only 2 or 3 hours of sleep, I was awake by 6 AM. The weather was still cold, but the wind had died down. 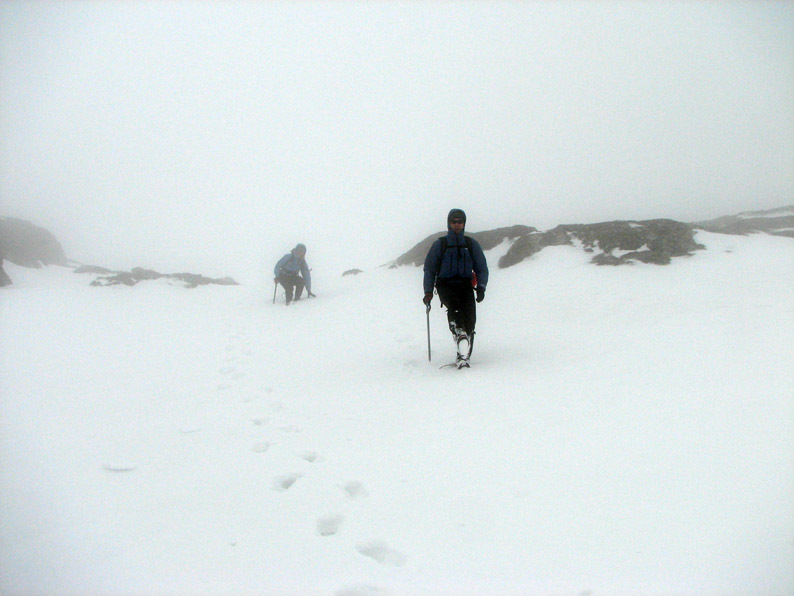 We were not in a great hurry to start though, because the mountains were socked in with clouds. We enjoyed a leisurely breakfast, packed up, and waited around. I experimented trying to get my camera to take a time lapse of the clouds swirling around the mountains. 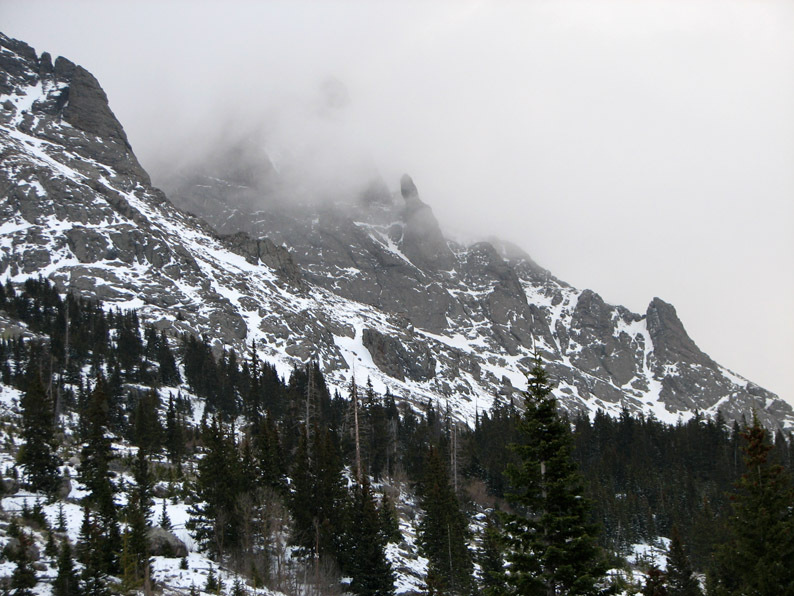 Crestone Peak hides in the clouds . . . 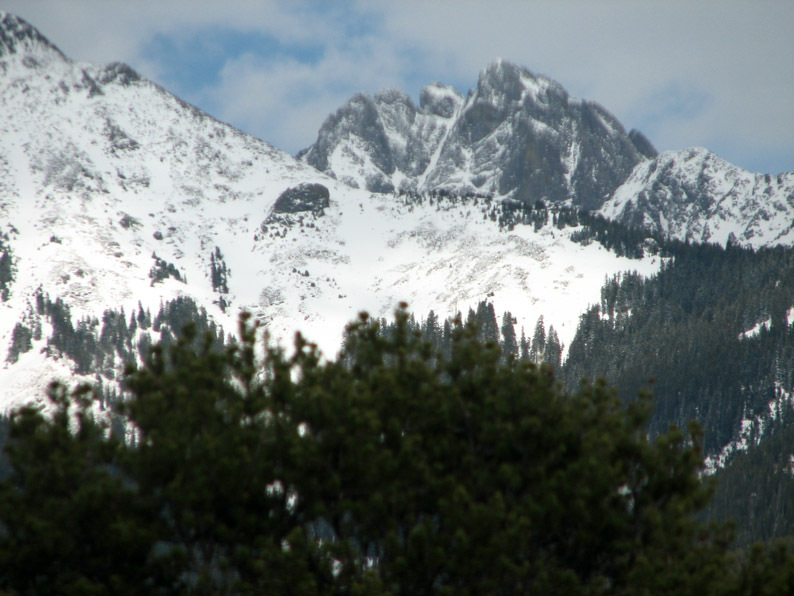 Kit Carson Peak is equally shy . . . But once in a while, the clouds would clear off revealing the full peak. 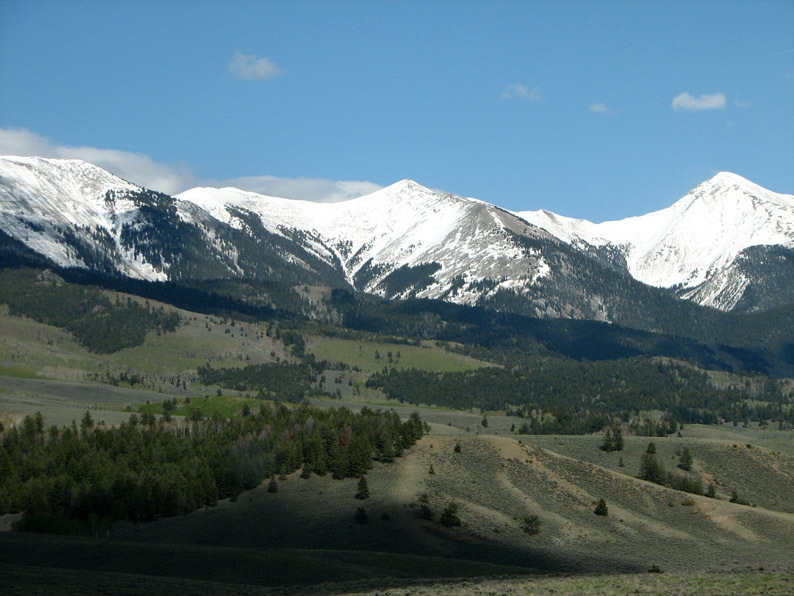 These were truly spectacular mountains - this picture (taken later in the day) shows 'The Prow' on Kit Carson Peak. 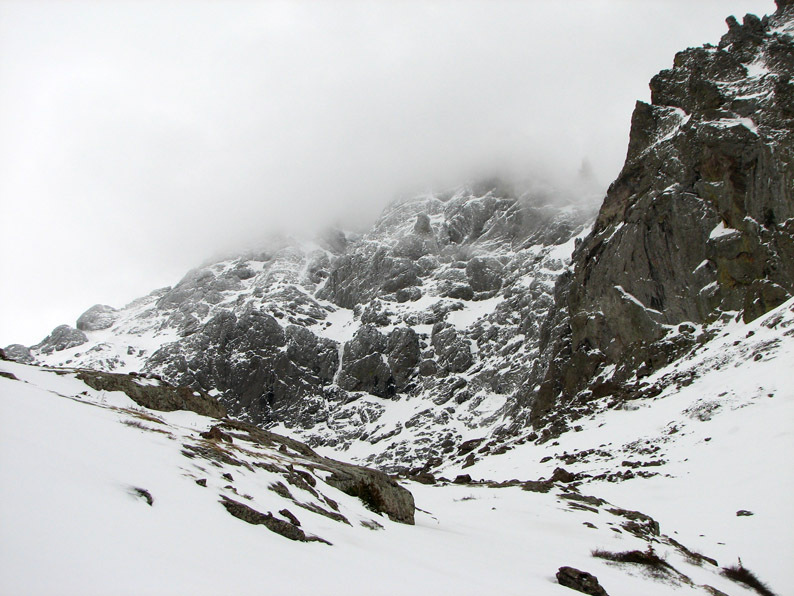 Believe it or not, but there is a climbing route which ascends the knife edge from lower right up towards the top center! Here is the view looking west down towards the valley from our camp. Lacking anything better to do, we decided to break camp and head up the mountain, hoping that the weather would clear in time to allow us to gain the summit. Hiding our packs under an apparition we hoped would scare curious marmots, we left camp at 9:00 AM. The snow quickly deepened from the 4-12" around camp to several feet deep in the trees. 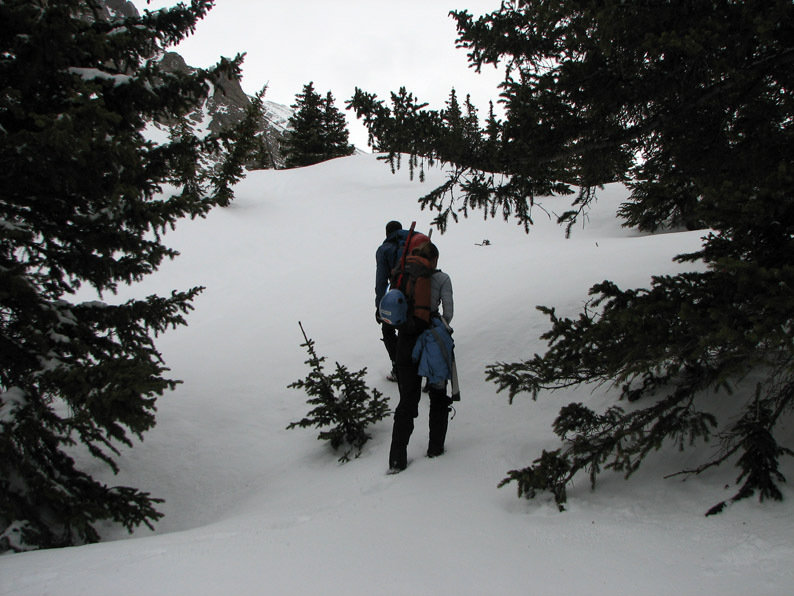 There were quite a few places where the snow was soft, leading to "postholing" (that is when you fall through the snow, sometimes up to your hips, leaving a "posthole"). It was definitely good exercise - I was beginning to wonder why I left my snowshoes at the car. 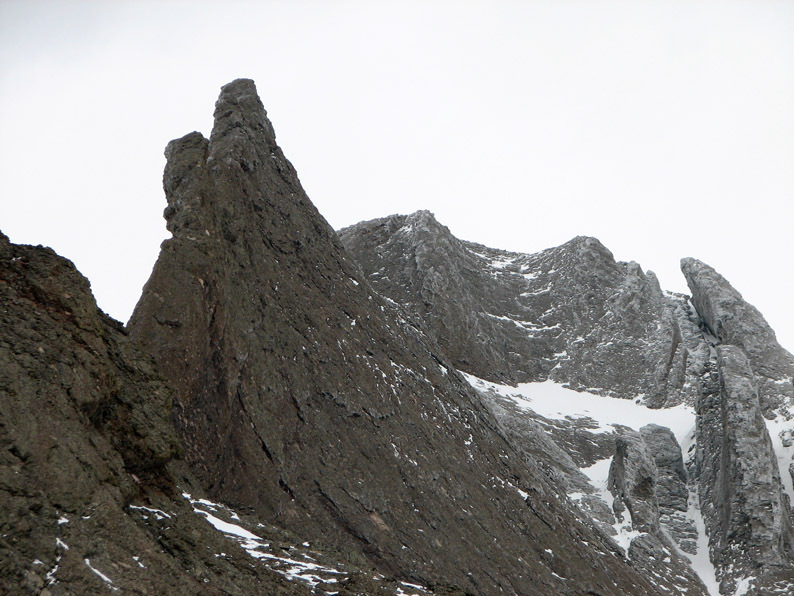 As we climbed past 12,000 feet, we passed beneath the looming hulk of The Prow, seen here edge on. For a while, the weather looked like it might cooperate. At camp, it was 34 degrees when we left. As we climbed, the temperature dropped and the winds picked up. It definitely felt like winter. 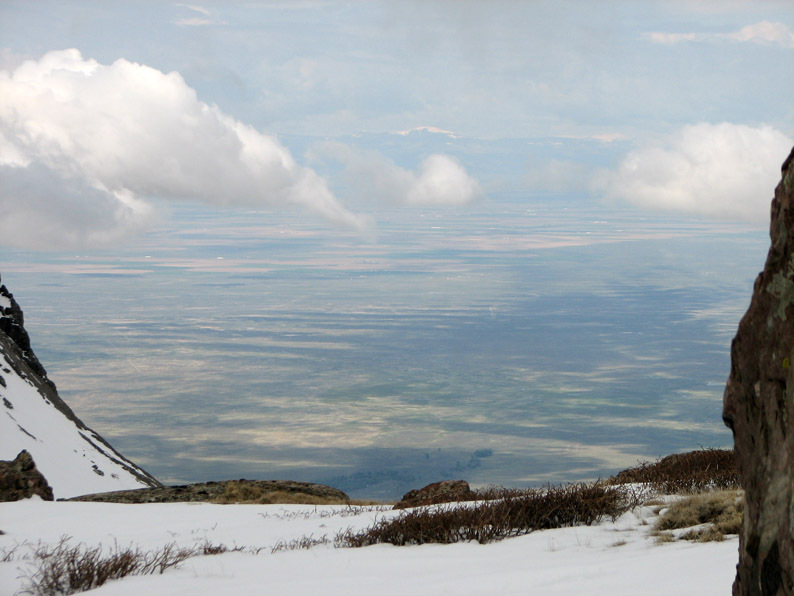 Here is a panoramic view of the basin looking southeast. Click the picture for a full size version [495 Kb]. 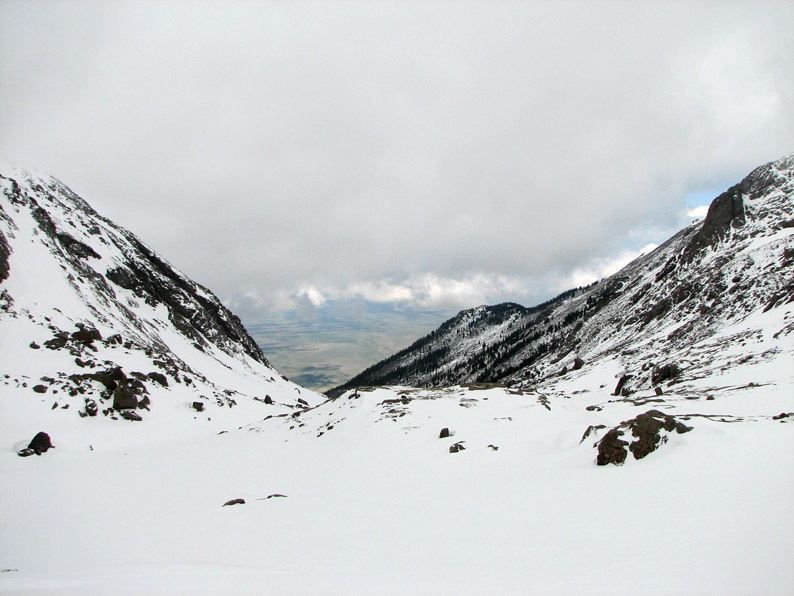 Here is a view looking up into the belly of Kit Carson Peak. The Prow is now on the left. 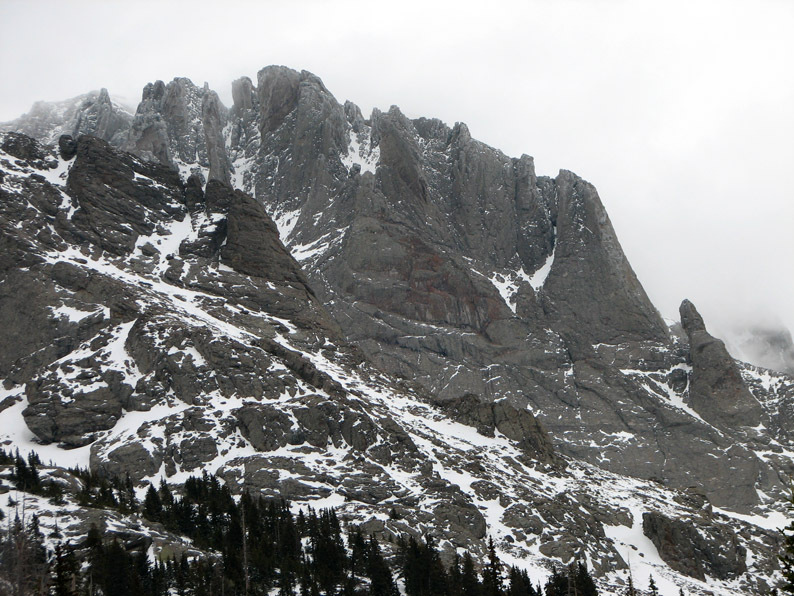 Crestone Peak was still hiding - this sight was quite worrisome. 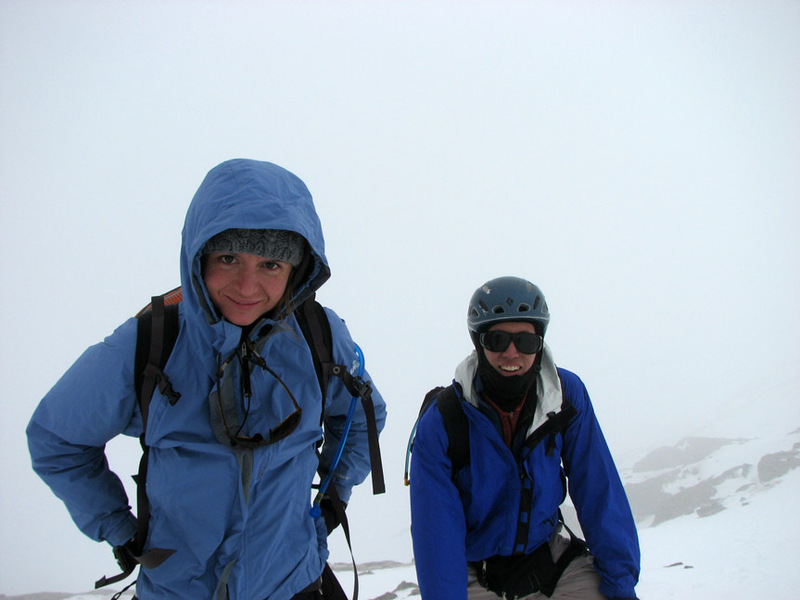 We definitely did not want to be doing a steep snow climb in low visibility - even on Colorado's "small" mountains, it is easy to get lost and quickly find yourself in dangerous places. 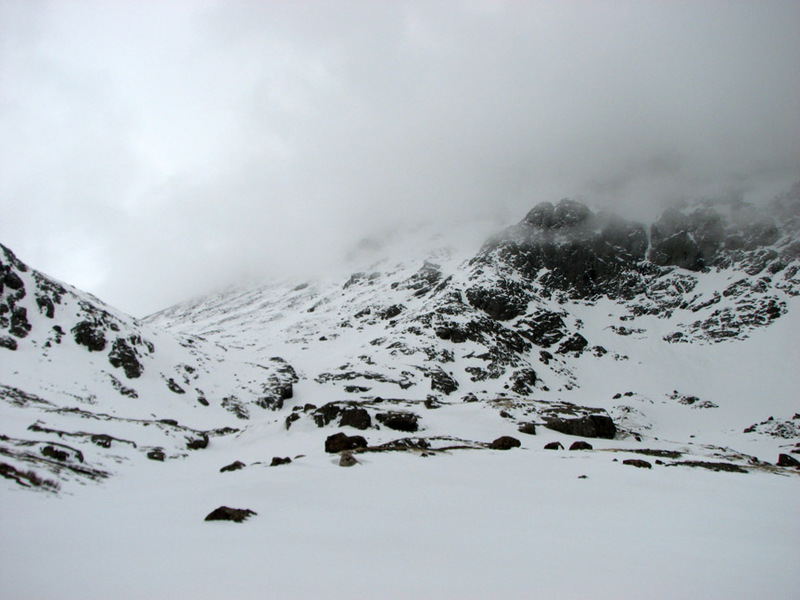 The clouds started lowering even more, dashing our hopes for a summit day. 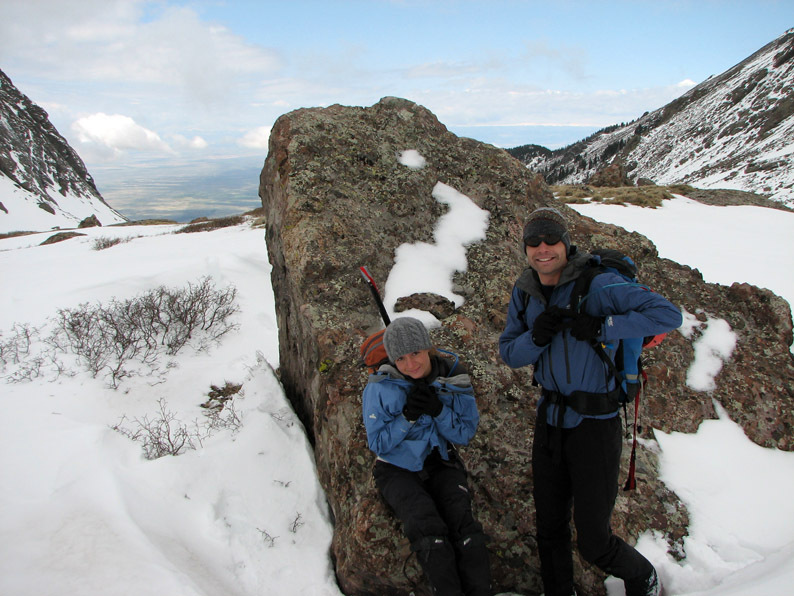 We stopped behind this big rock to grab some nutrition (I enjoyed a classic of cold weather mountaineering, a Little Debby 'Nutty Bar' - these are great because they don't freeze like some other snacks, yet provide over 300 calories of tasty energy). While we hunkered behind our rock shelter, the green of the valley below reminded us that it was almost summer at the lower elevations. We started a steep climb up to a bench at around 12,400 feet. Looking back, we saw another wave of clouds coming up the valley. 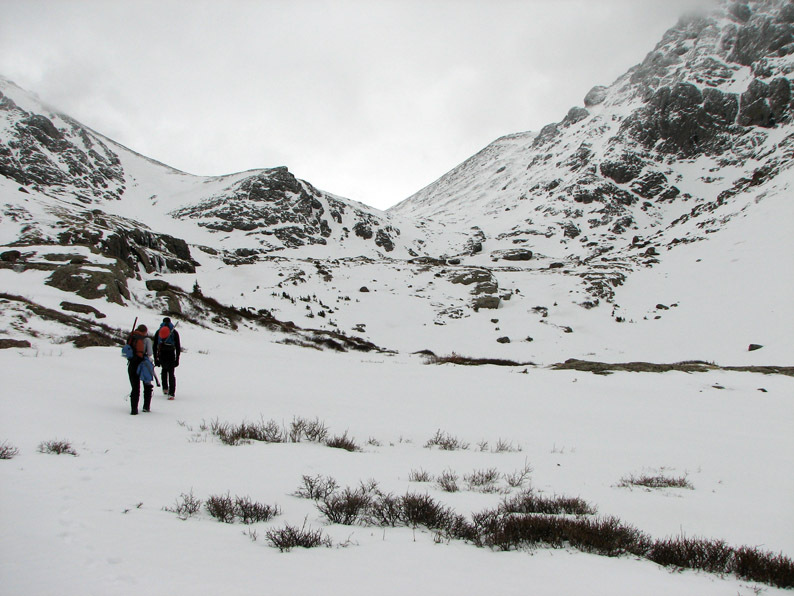 About this time we decided that it was not prudent to continue further. It had taken us an 1h38m to get to this point. As the cloud came in, visibility quickly dropped to a hundred yards or less and the winds were 15-20 mph with gusts to 30 mph or so. With a temperature of 29 degF, the wind chill was getting quite cold. While we were a bit disappointed to have to turn around, we were glad to not worry about being in this weather for many more hours. It was a relief to descend back down to the warmer environs of camp. We arrived back in about an hour, getting back a little before noon. We had travelled 3.0 miles and 1500 vertical feet. The temperature was 44 when we got back - certainly nothing life threatening. It turned out that our decision to bring food for two days was a good one - at least we wouldn't have to hike back to the car for more food. With the whole afternoon ahead of us, we decided to work towards a new and improved situation. 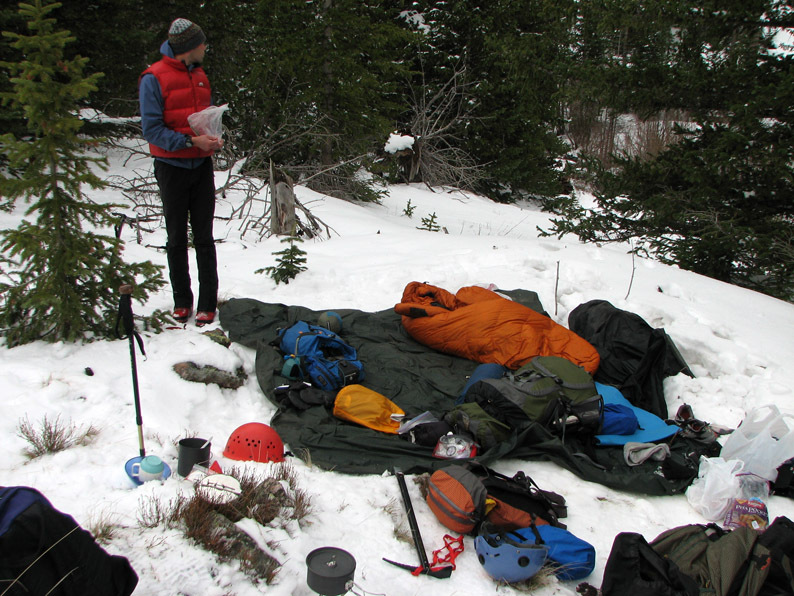 We stomped down the snow, attempting to create a flatter sleeping surface. Eric cut snow blocks with his ice axe in an attempt to keep the wind from blasting us in the middle of the night. At about 1 PM, the clouds cleared off and the sun came out. The weather was playing tricks on us - we began to wonder if our decision to turn around was really necessary. But then another bout of winds and precip came in at about 2 PM. I retreated to the tarp shelter and read for a while, then drifted off for a pleasant nap. 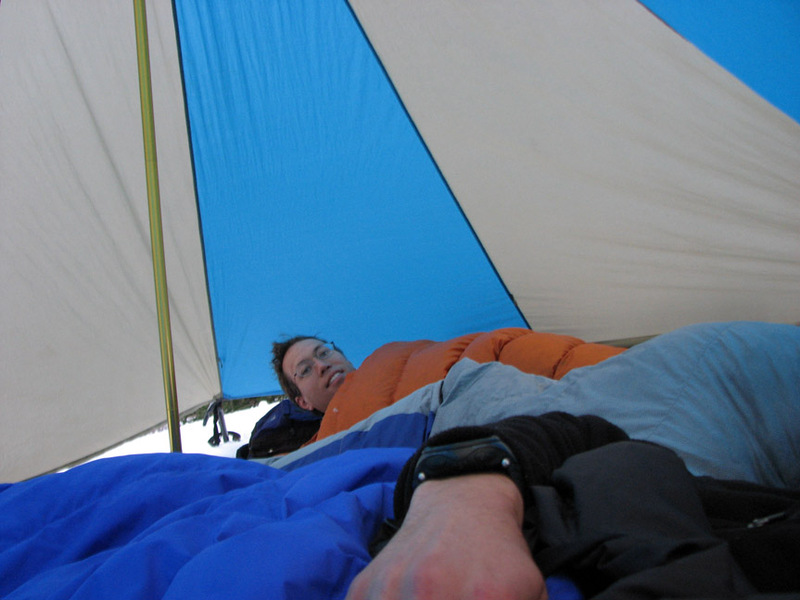 When I woke up, the sun was shining again and it felt like it was 80 or 90 degrees inside - the sun was back out and the tarp shelter had warmed considerably. Even though it was still in the 40's, this felt a little like being at the beach! Our spacious tarp shelter . . . The afternoon sun brought out the relief on Challenger Point. 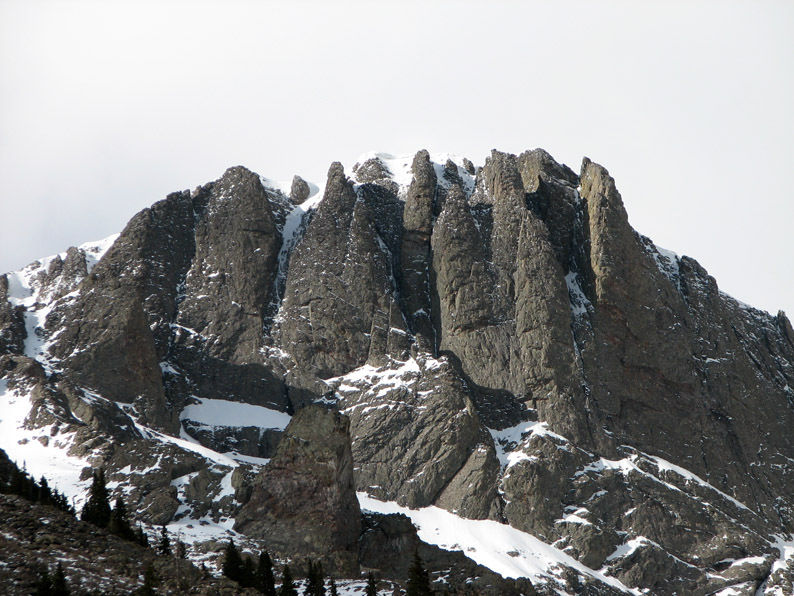 The shear cliffs look a bit like cathedral spires or organ pipes. We filtered water, packed our climbing packs, and enjoyed an early supper (unfortunately, my small gas canister ran out of fuel before everyone had cooked), and settled down for the night right around sunset. This concludes Part I of this trip report. Click here to go onto Part II to find out whether we made the summit and survived the trek back down.